I was taught this figure by a young man of the Bagobo Tribe in the Philippine Reservation at the St. Louis Exposition in August, 1904. He had no name for it. I found that it was also known to the Philippine Linao Moros. Second: Release the loops from the little fingers. There is now a loop on each thumb and a loop on each index (Fig. 88). Third: Transfer the thumb loops to the index fingers by taking up from below with the back of each index the far thumb string (Fig. 89, Right hand). You now have on each index, two loops, an upper and a lower (Fig. 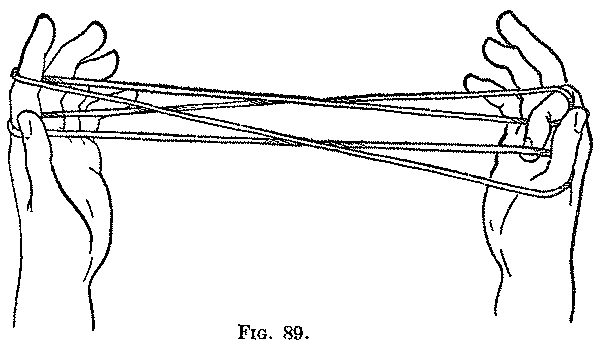 89, Left hand). Fourth: Pass each thumb away from you over the lower near index string, and with the back of the thumb pick up, from below, the lower far index string, and return the thumb to the original position (Fig. 90). Fifth: Pass each thumb away from you over the upper near index string, and with the back of the thumb pick up, from below, the upper far index string, and return the thumb to the original position. 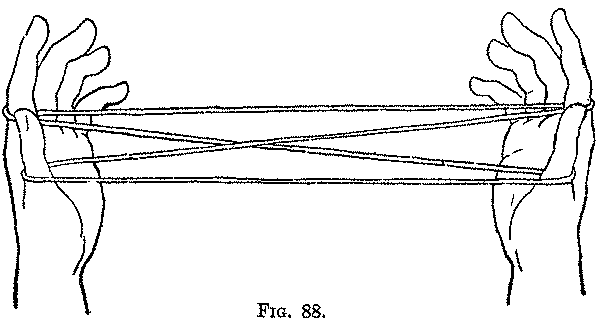 By these movements the far strings of the two index loops are crossed over their corresponding near strings, and pass around the backs of the thumbs to become lower and upper near thumb strings (Fig. 91). 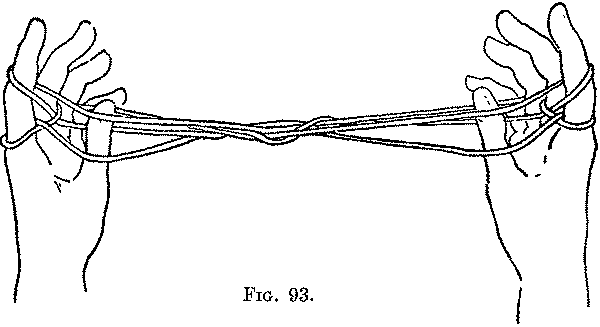 Sixth: Pass each ring finger over the upper near index string and pick up, from below, on the back of the ring finger the lower near index string (Fig. 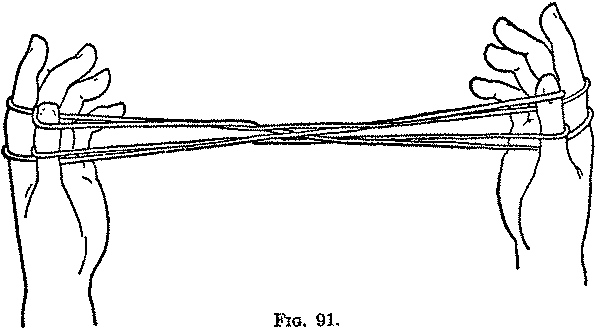 92), and return the ring fingers to their positions (Fig. 93). Seventh: Pick up with the teeth, close to the back of the thumb, the right lower near thumb string, and lift it over the tip of the thumb, and drop it on the palmar side, being careful not to disturb the upper near thumb string. Repeat this movement on the left hand by picking up with the teeth the left lower near thumb string, lift it over the tip of the thumb, and drop it on the palmar side. 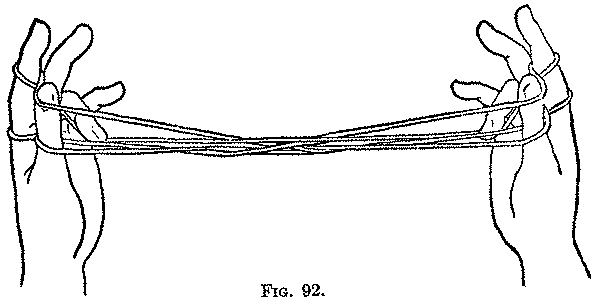 Eighth: Keeping the strings drawn tight, swing the left hand down, and turn it palm up with the fingers pointing away from you; turn the right-hand palm down with the fingers pointing toward you and the completed figure appears (Fig. 94). In this figure the Fourth and Fifth movements are unlike anything observed in the preceding figures. 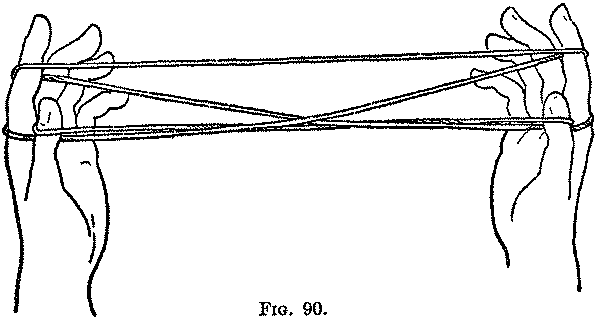 The interesting point, however, lies in the fact that while both hands do the same movements throughout the figure, the finished pattern will not appear unless one hand is revolved through half a circle. Moreover, when the pattern does appear, it is not perfectly symmetrical.